Inside the data directory the TILT!Audio* process writes a logfile for each run and holds up to 4 logfiles, before they get deleted. Logfiles are useful for finding problems / debugging. If you have a license file or key file, just put it into the data directory. If you are using usb sound devices with build-in sound you need to place a file „use-usb.txt“ in the data directory. This is only needed for Pi models with internal sound interface (build-in 3.5mm jack). Update: also use for pi zero. Sound effects are in one of 5 categories: music, voice, sfx, jingle, single. Depending in what directory you put the sound effect playback behaves different. jingle: short music clips, that interrupt background music. background music is resumed after jingle stopped. Sound effect directories always starts with a 6 digit nummer and a dash like „000017-game_over“. The name part after the dash is up to you, TILT!Audio* uses only the 6 digit number. Its the ID of the sound effect. The ID must be unique for a sound set. Additionally the file name in the folder can override the ID. So if the file itself starts with a number like „0000122-foo.ogg“ 122 is pulled as ID instead. All these settings are optional, so the raspisound.ini file itself is also optional. say_version, say_preload and play_boot options speed up the boot process as a couple of messages are skipped. Also if you switch off preloading of samples in main memory, the startup process is a lot fast, but in contrast the first use of a sample has a short delay, because it needs to be loaded first. Sample pool size controls the amount of memory that is used for preloading sound into ram. If you use a pi 3 normally all sample should into main ram without any problems. The first „ducking_xx“ settings controlling the „ducking“ or lowering of the background music when a sample of a specific type is played. e.g. if ducking_voice is set to 80 this means that background music volume is lowered to 80% while voice callouts are playing. The „gain_xx“ settings control the overall weight of the sample types for this sound set.Gain settings range from 1 to 30, where 15 is the default. So if you want sample type sfx louder go above 15. So if you want to have voice louder compared to background music, you can e.g. set gain_music=11 and gain_voice=24. This was formerly achieved by putting a gain.txt (see below) file in the respective subdirectory itself, but its now consolidated in one ini-File. As soon as the sample is over volume of background music goes back to 100%. fade_sfx_on_music_change / -time controls wether on background music change a running sfx is faded out or not. Additionally you can also set the fading time in milli seconds. There are soundset that use rather long sfx samples, so it makes sense to fade the sample until the music track changes. There are a couple of sound mixer available that are using scramble hashes in the filenames. You can recognize this by the big random like numbers in the file / directory names. If your sound set is like that you need a lookup file to descramble the hashes and map them to the IDs of the real pinball machine. The file should be placed in the sound set directory itself and named „config.raspisnd„. You can check in the download section, if there is already a mapping available for your machine. As you can see its starting with the setting from config.ini above and the continues to covers all ID mappings all in one file. Like described above sound effect directories always starts with a 6 digit number and a dash, that defines the ID of the sound effect. The sound effect directory can hold up to 10 sound files (ogg, wav, mp3) that are played when the pinball machine sends a „play sound <id>“. If there is more than one sound file per effect, one get chosen randomly. gain.txt: if found it contains one line with a number 1-30 that increase or decrease the volume of that sample. 15 is the normal volume. dontpreload: if this file is found the sound effect never gets preloaded into ram. If a shake.txt is associated with a sound effect, a sequence of shaker on / shaker off commands is replayed along with the timing read from „shaker.txt“. E.g. a line of „1000 500 1000“ means turn shaker on for a second, the off 500ms and finally on again for 1 second. 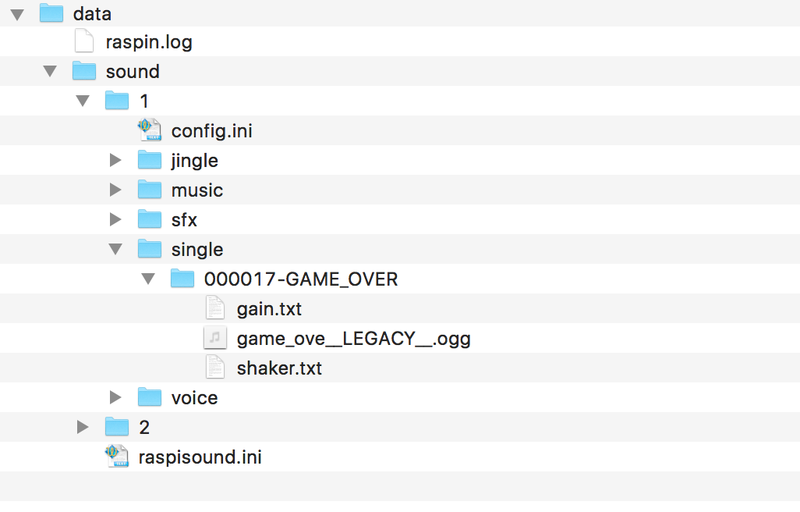 Shaker must enable in general for each sound set in the config.ini file. If you like to connect to the Pi directly on the console, connect via ssh and use the username pi, password is pi. If you need to have root access, the root password is also root. For testing you can stop the background service of TILT!Audio* by logging in to the pi as root using a terminal or if you have network running via ssh. Default password for the user pi is pi and root for root (you can and should change this as soon you connect the first time). first. NOTE: for Raspberry Pi Zero the only option is to use USB sound, but in contrast to Pi 3 USB sound is still recognized as card0, so no special AUDIODEV environment variable needed for Pi Zero. To update the TILT!Audio* firmware you need to place an update package into the update directory of the sd card. in order to get recognized by the automatic updater, the update package must be named „update.zip“. After file has been copied, restart the raspberry pi and update should happen automatically. If you look into update directory after pi restart, the update.zip should be renamed to update-done.zip. This indicated, that the automatic updater has picked up the file and done the update. Power: +5V input power, lower terminal is ground. 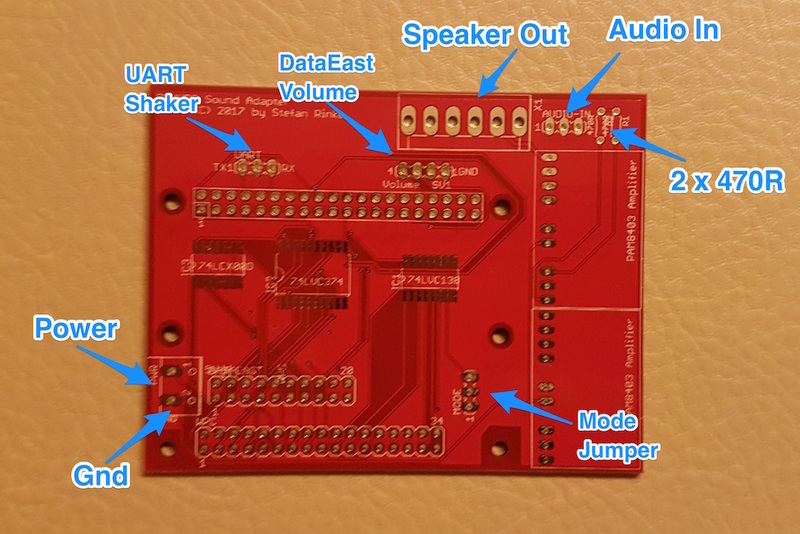 UART / Shaker: extension connector for either UART output or shaker. Actually only shaker is supported. Shaker control is connected to pin 1 / TX. Be careful not to overload TX / pin 1 (directly connected to GPIO of the pi). You need to have a relay switch in between. Remark: for DataEast IC1 (74×138) must be left blank. Note: on the bottom side, there is one additional connection needed (only for rev 1.9). Was fixed in rev 1.9b and newer. 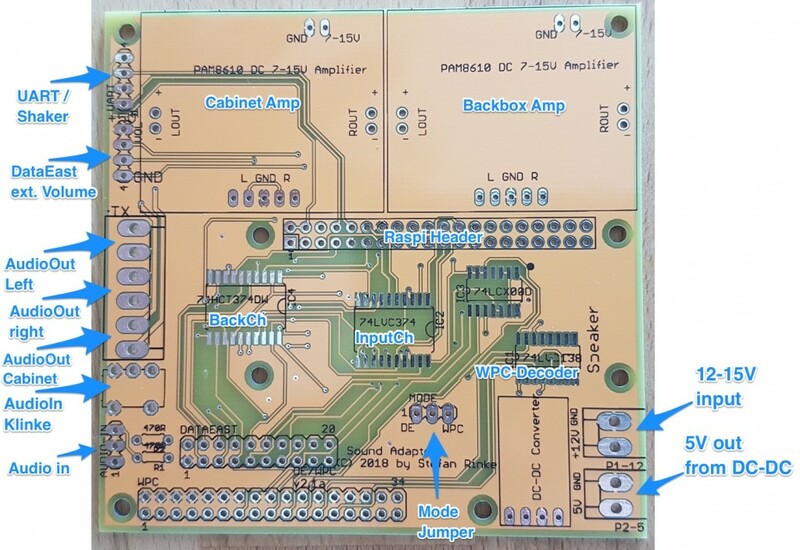 The board come with a DC-DC power converter that creates to 5V for the PI out of the main power supply 12-15V (right connector). So the 5V connector on the left in normally not needed. 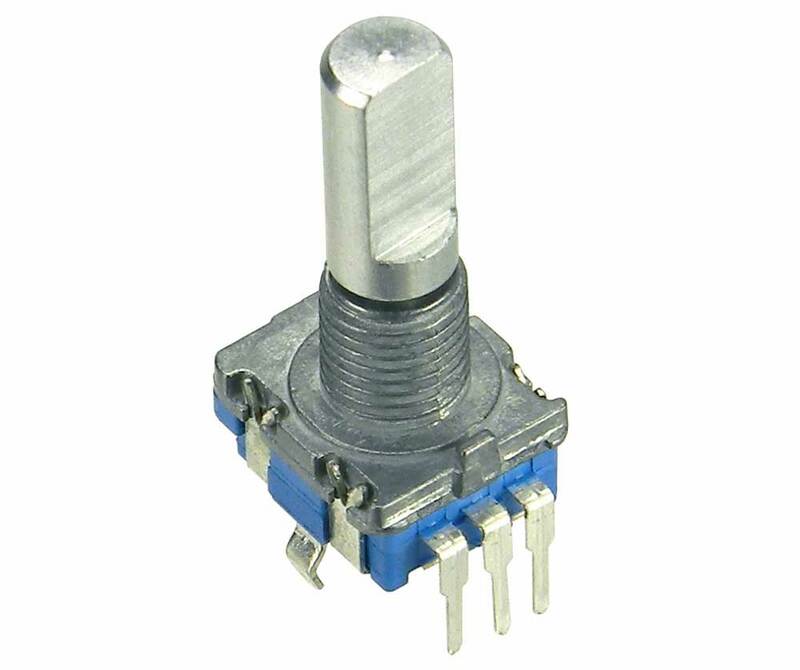 You could use it, if you have some small additional 5V load. Power supply should be >3A (~40W) depending on the power output you expect from the amplifiers. 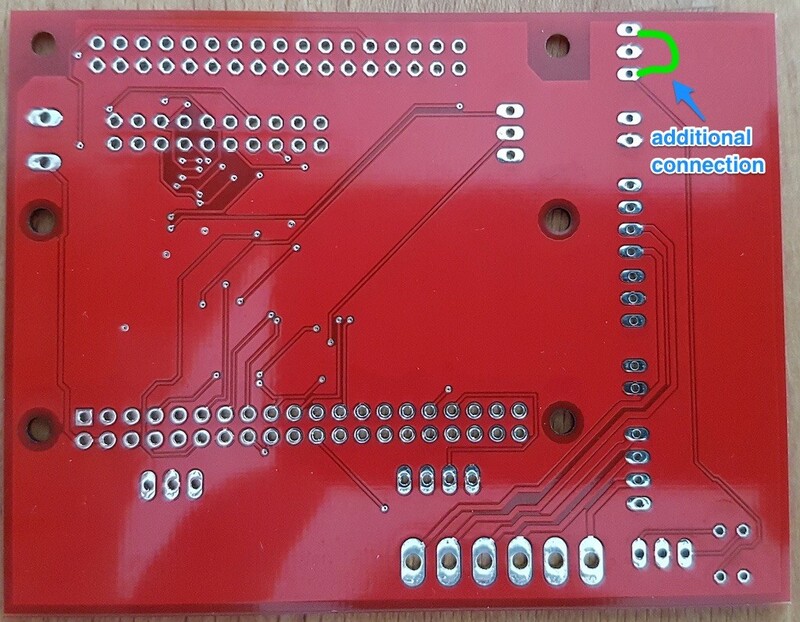 For DataEast there is an additional connector (DataEast ext. vol). This could be used to provide and external control for volume and sound set switcher. This is generally not used for WPC as volume is controlled by the main cpu. 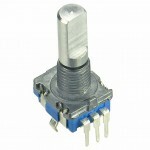 If you want to provide a external volume controller you need to connect a rotary encoder with push button like this one. The PI’s power supply is done via GPIO connector, so no extra power supply needed for the PI. PI3 place a female header with long pins UNDER the shield / PCB. PiZero place a normale female connector on top of the PCB and the male pin header for to PiZero under the Pi. Or to say it easy: the PiZero sits on top of the PCB, Pi3 underneath. Also for Pi3 be carefule not to create a short if the PCB is touching the PIs USB / ethernet outlets. Safest is to put and isolating strip in between. BackCh is not used so far, so IC4 (BackCh) will be unpopulated. Rev 2.1 was better optimized for PiZero (more space for USB connectors). All other notes from 2.0 revision stay valid. First of all, i have to say a very big THANK YOU for all the work you are doing for the pinball community, adding lots of new features to our beloved old DE and WPC machines. Your projects are awesome to say the least!! And then next up i have a couple of questions for you if you don’t mind. I guess you are really busy, but i will give it a shot anyways. 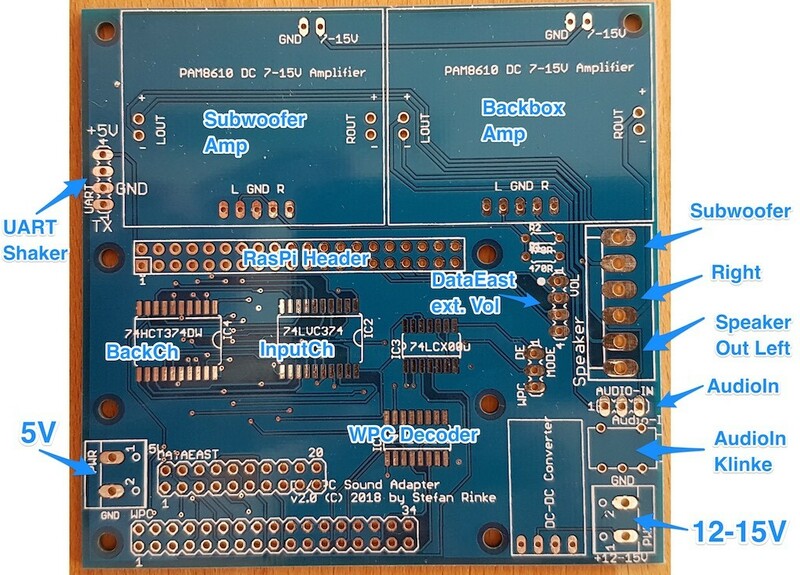 1: Raspinsound hardware: If i buy the 1.9 kit plus a license (http://go-dmd.de/produkt/kit-v1-9-fuer-raspberry-pinball-sound-projekt/) do i need anything else other than the PI and a SD card to replace my existing sound board and start playing with new sounds? Do i need a power supply , or is power taken from the existing wires in the WPC machine? And if i need external power, is it only 5V for the PI, or do i also need 12V for the amps? 3: If i just want to start by using the original sounds, how do i get these? Lets say i want to use a raspinsound for my Williams IJ, how do i get the unhashed sound mix ready for me to use and modify? Is this even possible?